In the state of Florida, it is estimated that one racing dog dies every three days, and between May 2013 and January 31, 89 Greyhounds died. Greyhound racing is one of the most controversial practices in the dog world today. Despite lobbying from the gaming industry and attempts by some lawmakers to reintroduce Greyhound racing in some areas, 43 U.S. states have already banned the cruel practice to some degree, and only 24 tracks are in operation nationwide. In the sunny state of Florida, however, Greyhound racing is alive and well, with 13 tracks still operational today. Animal advocates, like those from the organization Grey2K USA, believe Florida is largely behind the times when it comes to laws protecting racing Greyhounds. It wasn’t until last year that Florida dog tracks were mandated to report the number of dog deaths at their facilities. According to a March 17 article by the Herald-Tribune, 89 Greyhounds died at Florida racetracks between May 2013 and January 31 of this year. It is estimated that one racing dog dies every three days in the state of Florida. 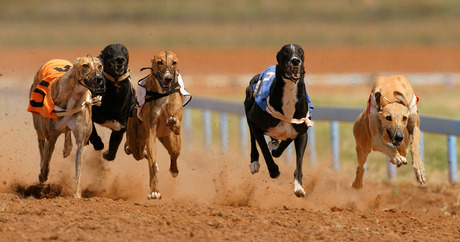 Some die from heat stroke, some perish by running into electrified wires around the perimeter of the tracks, while other dogs are euthanized after suffering racing injuries. And Florida is one of only two remaining states that doesn’t require track operators to report racing-dog injuries; the other state — Florida’s neighbor, Alabama. But if a group of Florida legislators have their way, there could one day be more oversight aimed at regulating the industry and protecting more racing dogs in the process. Lawmakers, including Florida Democratic Senators Maria Sachs and Eleanor Sobel, are hoping to crack down on dog racing in their state, both recently introducing measures to the Senate Gaming Committee. Sen. Sachs focused her efforts on a provision to the Senate gambling bill that would “de-couple” dog racing and gaming at Florida tracks. Back in 1997, Florida lawmakers passed legislation that allowed dog track owners to establish card gaming rooms at their facilities — as long as they agreed to continue running 90 percent of the dog races they previously ran. That means each track must hold at least 100 live races each year. During an April 8 session, however, Sen. Sachs was forced to withdraw a proposal that would effectively “de-couple” dog races and other forms of gaming at the state’s tracks when it became clear it would not have the votes to pass. There was also concern that the wording might pave the way for currently closed tracks to open their doors again. While Senator Sachs’s measure would not have put an end to dog racing in her state, it would have made the practice optional, giving track operators the chance to offer their customers slot machines and poker rooms without necessarily having to race dogs at their facilities. “If a Greyhound track wants to race — if it’s profitable for their business model — they should be allowed to race. If it’s not, they should not be required to race because of a state mandate,” Sen. Sachs tells the Miami Herald. But dog racing is a pricey venture, and Greyhound racing has sharply declined in popularity — and profitability. The Sun-Sentinel reports that only three Florida tracks saw profits in the black during the calendar year 2013. The total amount of money made at Florida dog tracks declined by a whopping 72 percent between 1990 and 2013. Supporters of “de-coupling” believe many track owners would cease their dog racing operations if given the option to do so. “The attendance has gone down. The treatment of the dogs, of course, has gone down as well because they’re not making money anymore,” Sen. Sachs tells WGBH News. Republican Representative Matt Gaetz, son of Florida Senate President Don Gaetz, was one of the advocates of the shelved “de-coupling” provision. “It’s a shame every time you have a bill to protect Greyhounds, the gambling special interests start salivating,” Gaetz tells the Northwest Florida Daily News. “We’re forcing a company to do what they don’t want to do by maintaining something people don’t want to participate in that happens to be barbaric,” he added in a statement to the News Herald. Not all is lost, though: The Senate Gaming Committee did pass a measure that would require all dog tracks in the state to report animal injuries. Senator Sobel’s Senate Bill 742 passed in the committee by a vote of 13-1. “We need to free the Greyhounds from this senseless activity of racing,” Sen. Sobel tells the Associated Press. Grey2K Executive Director Carey Theil calls the proposed legislation a big step in the right direction. While lawmakers have already all but thrown in the towel on comprehensive gaming reform, Sobel’s Greyhound bill still has traction. Senate Bill 742 still has to pass in the appropriations committee then go to the Florida Senate floor before it officially becomes law, but advocates are confident they will be able to keep it on the table. And advocates of the “de-coupling” amendment plan to reintroduce it again as well, calling it stalled and not failed. Sen. Sachs plans to work on revisions to her amendment and present it again during the final weeks of the session.